GEMSTONES: The ring holds an oval natural light blue aquamarine. It is in nice shape with an approx total weight of 1.15 cts (6 mm x 8 mm). EXTRA: The ring holds an oval crisp light blue aquamarine in the center. GEMSTONES: The ring holds a radiant cut light blue aquamarine. It is in nice shape with an approx total weight of 2.50 cts (8 mm x 8 mm). EXTRA: The ring holds a radiant cut crisp light blue aquamarine in the center. GEMSTONES: The ring holds a marquise natural blue aquamarine. It is in nice shape with an approx total weight of 3.00 cts (7 mm x 15 mm). It is a little loose in the setting. EXTRA: The ring holds a marquise crisp light blue aquamarine in the center. (60) Diamonds weigh about 1/2 Carat and 8 x 6mm Aquamarine that weighs about 1.50 Carats. 2 Carats Total Weight. Size 6 1/2. Ring and appears as new but used and is in excellent condition with no major repairs or problems. Gorgeous Art Deco Santa Maria Aquamarine Ring. Filigree Art Deco Setting. 100% Natural Blue santa Maria Aquamarine AAA , no heat. Large Aquamarine = 6.50 ct (11.14 x 9.08mm approx). 18k White Gold. We will then send you an invoice for your cost of sizing, (invoice for sizing due upon receipt). Solid platinum mounting Hallmarked in shank. GIA graduate. 3rd generation. (★Center Stone：100% Genuine Lightest Blue Aquamarine. Setting：Pave,Prong Setting. ★Side Stones：100% Genuine Natural Diamonds. My jeweler has over 10 years of experience in handling gem stones. 4) Upgraded Diamonds (full cut, VS/VVS clarity or other). Size：9x7mm. ★Center Stone：100% Genuine Aquamarine. Ring Size：6.5. Width Top：9.2mm. Service you wholeheartedly. You will get response within 24 hours. we are very glad to help you. Stamped：10K/417. Diamond Color: Aqua Blue. Main Diamond Type: Lab-Created Diamond. Diamond Weight: 3.20Cts. Diamond Clarity: VVS1. You must complete your order using the order process. Ring Type: Solitaires with Accents. Style: Diamond & Aquamarine Ring. Stone Type: Natural Aquamarine. Settings Gold Ring. Gemstone Gold Ring. Diamond Wedding Bands. New Arrival. Natural Diamonds Weight: 0.32ct. Settings Gold Earrings. Color : White, Aqua Blue. Sterling Silver : 925 Hallmark. Diamond Setting : Prong. Cut : Excellent. Certified 3.60Ct Aquamarine Cushion Cut Engagement Ring In 14K White Gold. Diamond Color: Aquamarine& White. Diamond Shape: Cushion & Round Cut. Main Diamond Type: Lab-Created Diamond. You must complete your order using the order process. Diamond Weight: 3.60Cts. Diamond Clarity: VVS1. This STUNNING ring has been handcrafted in SOLID 9ct Rose gold. It has a large SPARKLING NATURAL Aquamarine of princess-cut as center stone, that sits high above a gorgeously pierced gallery. The light-blue Aquamarine is accentuated by NATURAL ,GENUINE DIAMONDS which are set into the ring top as border, and on the shoulders. This STUNNING ring has been handcrafted in SOLID 9ct Yellow gold. It has a large SPARKLING NATURAL Aquamarine of princess-cut as center stone, that sits high above a gorgeously pierced gallery. The light-blue Aquamarine is accentuated by NATURAL ,GENUINE DIAMONDS which are set into the ring top as border, and on the shoulders. Certified 2.15Ct Aquamarine Cushion Cut Engagement Ring In 14K White Gold. Diamond Color: Aquamarine& White. Diamond Shape: Cushion & Round Cut. Main Diamond Type: Lab-Created Diamond. You must complete your order using the order process. Diamond Weight: 2.15Cts. Diamond Clarity: VVS1. Properties & Symbology: Did you know Aquamarine is a "stone of courage?". Its calming energies reduce stress and quiet the mind. Aquamarine has an affinity with sensitive people. It is reputed to help people to learn quickly. ★Center Stone：100% Genuine Aquamarine. Setting：Pave,Bezel,Prong Setting. ★Side Stones：100% Genuine Natural Diamonds. Shape：Round. Shape：Round Single Cut. Ring Size：6.5 (resizable). Width Bottom：1.6mm. Main Diamond Color: Aquamarine. Ring Type: Solitaire with Accents. Main Diamond Type: Lab Created Diamond. Main Diamond Weight: 25.0 Cts. Main Diamond Clarity: VVS1. Ring Size: 7 US (Free Sizing). You will be responsible for all import duties in your country. Size：8x6mm. ★Center Stone：100% Genuine Aquamarine. ★Side Stones：100% Genuine Natural Diamonds. Ring Size：6.5 (resizable). Color：Sea Blue. Width Top：14.59mm. Service you wholeheartedly. You will get response within 24 hours. Center blue Aquamarine size appx : 6.20×6.1 mm, 1Ct. Total diamond weight appx: 1 Ct. Ring top size appx : 12.7×12 mm. 18K WHITE GOLD NATURAL AQUAMARINE & DIAMOND RING. Style: Diamond & Aquamarine Ring. Gem Type: Natural Aquamarine. Shape: Cushion Cut. SIDE SMALL DIAMOND Color: G-H White. CENTER STONE Color: Blue. This STUNNING ring has been handcrafted in SOLID 9ct White gold. It has a large SPARKLING NATURAL Aquamarine of Cushion-cut as center stone ( app. 10x10mm size), that sits on a high mount. The LARGE aqua-blue Aquamarine is accentuated by NATURAL ,GENUINE DIAMONDS which are set into the shoulders. Lab Created Aquamarine, & White Diamond. Aqua & WHITE. Main Diamond Shape Marquise. Secondary Diamond Shape. Diamond Color. Signity Diamond's are bright white man made diamonds with more sparkle than natural diamonds. It pairs beautifully with a diamond wedding band due to the straight shape of the ring. 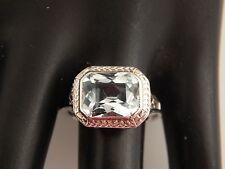 This ring is a size 6 and is in excellent condition. Size：7x5mm. ★Center Stone：100% Genuine Lightest Blue Aquamarine. Ring Size：6.5 (resizable). Width Top：10.3mm. Service you wholeheartedly. You will get response within 24 hours. we are very glad to help you. ★Center Stone：100% Genuine Aquamarine. Shape：Cushion. Color：Sea Blue. Generous Diamond & Gemstone Jewelry. Ring Size：6.5. ★Side Stones：100% Genuine Natural Diamonds. Width Top：7.9mm. You will get response within 24 hours. Style: Diamond & Aquamarine Ring. Stone Type: Natural Aquamarine. Settings Gold Ring. Gemstone Gold Ring. Diamond Wedding Bands. New Arrival. Settings Gold Earrings. Settings Gold Pendant. Size：8x6mm. ★Center Stone：100% Genuine Aquamarine. Setting：Prong Setting. Ring Size：6.5. Width Top：11.3mm. Service you wholeheartedly. You will get response within 24 hours. we are very glad to help you. Gold 9ct, 9K, 375 Solid Yellow Gold. BEAUTIFUL ring, handcrafted in SOLID 9ct Yellow Gold. It features a Large, NATURAL Aquamarine as centre stone, masterfully set into half-bezels ! GORGEOUS Solid 9ct GOLD NATURAL AQUAMARINE Solitaire Ring.